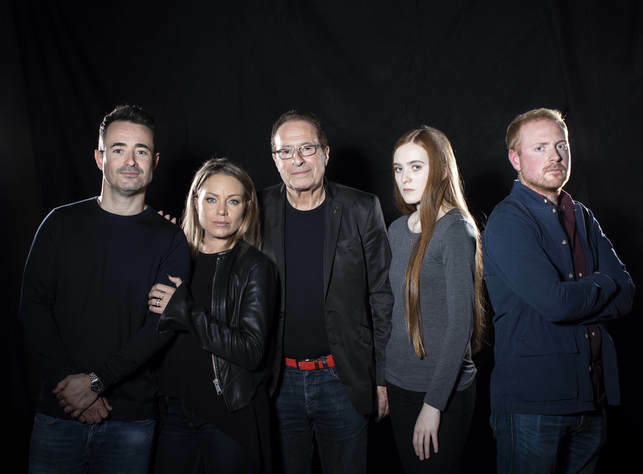 If you like a ghost story and chills and thrills, head down to the Palace Theatre for the adaptation of Peter James’ novel The House on Cold Hill. We knew what we were in for, when the play started with a recording of the author’s voice warning the audience, that he would ‘possess’ our phones. The story is a familiar one, a family move into a big old house and gradually find out the history which revolves around the men who have lived there dying on their 40th birthday. What is different about this one is the use of technology, a spine chiller for modern times. It brings the supernatural thriller bang up to date, and unsettles the audience. Could these items of technology that we have in our homes be hacked by the spirit world? It also makes an old clichéd mystery appeal to the younger audience. The daughter (Persephone Swales-Dawson) spends most of the time FaceTiming her friend Phoebe on her iPhone. A computer nerd (Charlie Clements) is busy installing IT programmes for the couple who have taken over the house and he sets up the software Alexa which develops a life of its own. I particularly liked Charlie’s performance as a quirky, twitchy computer geek. The couple played by Holby City favourite Joe Mcfadden and East Enders’ Rita Simons, spend most of the time listening to creaks and groans and things that go bump in the night. At one point it was like an episode of Most Haunted as the cast wandered around calling out for the ghost to reveal itself, especially when Charlie brought in his ghost box to pick up the energy. Joe gives his usual cheeky chappy performance, but from the opening scene, he has a highly energetic, fully charged performance. It might have been better to pace it with some light and shade, to allow a slow build-up for dramatic effect. He did manage to demonstrate a few dance moves to allow a joke about Strictly Come Dancing, which went down well with the audience. Rita as his wife gives a more nuanced performance. The play was slick and pacey with all the action taking place in a set that recreated an old, stone built monastery turned into a living space. It was creatively and effectively designed by Michael Holt, with leaded windows, a staircase and an ingle nook leading to a cellar. Additionally, there were spectacular special effects of dramatic, creaks, groans, doors opening, collapsing ironing boards and spooky phantoms. One jarring note was the arrival of a Madam Arcati type character Annie (Tricia Deighton) who was a caricature of a clairvoyant. She wandered around the stage as a strange, old hippy talking to herself. It didn’t work for me, as she didn’t add anything to the story. Additionally, Fortinbras, the local vicar played by Padraig Lynch who came to sell raffle tickets, was also a strange cove. Probably, as his name appears in Hamlet, he was just for dramatic effect. However, the behaviour of Annie and Fortinbras was so odd, I wasn’t sure if it was the interpretation of the director, Ian Talbot or the way it was written in the original novel. If you’re looking for something that will keep you on the edge of your seat, it didn’t quite work. However, although the ending was telegraphed via Alexa earlier in the play, there was still a twist. Additionally, the audience really enjoyed seeing their TV favourites on the stage and the spooky atmosphere of The House on Cold Hill.